Ok, so first of all let me tell Thank you to both of the ladies who found my blog LOVELY. 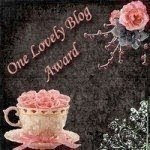 I am very thankful to be recognized in this community amongst my blogger friends, and followers. I started blogging last year not knowing where blogging was going to take me. One year later and I have met so many new people and am learning so much. I love sharing ideas, comments, and information that I find useful. I also just love sharing. We as mothers sometimes don't get to be heard. And here I know I am heard. Thanks for listening, coming by and just visiting every now and again. I hope to continue to provide everyone with good information, if not something to laugh about in my crazy life. With winning this award comes the resposibility of passing the torch on to fellow bloggers. Thank you Alba. Without your help and guidence I would have never known about the blogging world. Gracias! I'm so excited to receive this award, my first one.